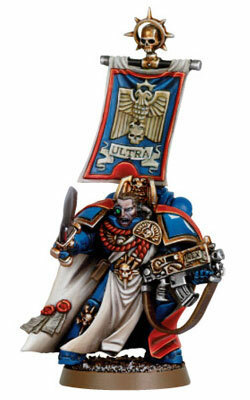 Can someone show me good painted robes of space marines? I'm talking about dress like robes of AotBR SM Captain. I'm trying to paint this for few days, but I surely need some inspiratino. I tried CMON but quality drops too fast and most of them looks flat. I'm trying to paint it to bleach bone/white color. Any adcive for shading will be appriciated (should I add blue, or just keep into browns?). Thanks and regards. Depends what kind of white color you want to get if it`s blue-white or brown-white I think try with space wolves grey, if your captain will be Ultramarine, that those colours will 'play' together. This is exactly the same mini I'm painting right now. "Testing" mini again, because I was not satisfied with previous one. Right now I have quite similar effect, but I'm not sure if I should push it a little bit further with contrast.